If you are looking for a warm winter getaway that doesn’t require a long plane ride or a passport, there is an alternative to the tropics you may not have considered: Death Valley. Whether you are searching for that post-holiday destination or planning ahead for spring break, the Hottest Spot on Earth may be just the thing. Although the 3.3 million square miles of arid terrain may seem an unlikely spot for a vacation – particularly during the summer months – late fall and winter are excellent times to visit. The daily high temperatures average 67 degrees in January, 73 degrees in February and 82 degree in March; perfectly civilized, if not typical “winter” weather. In addition, there’s plenty of sun, very little vegetation so very little in the way of pollen or allergens, and no mosquitoes. fed swimming pools, playing tennis, horseback riding, Jeep trekking, horse-drawn carriage rides and more. 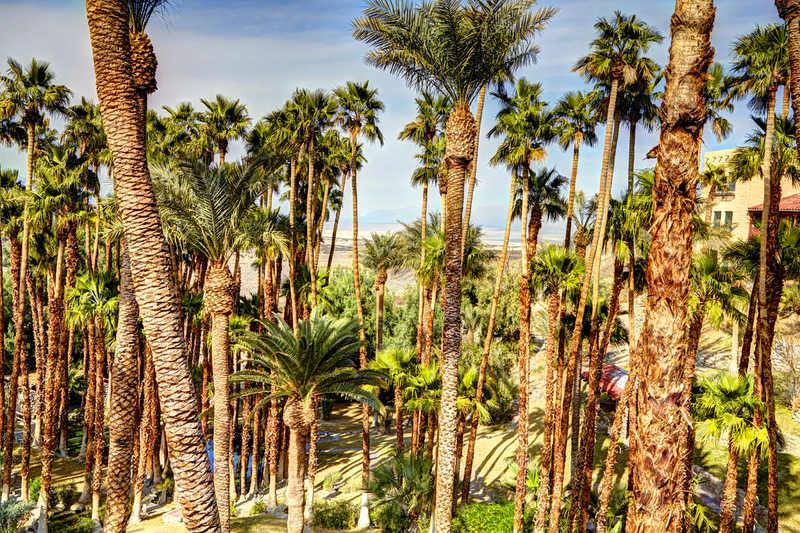 The center of all those activities is the man-made oasis in the midst of the natural wonder that is Death Valley: Furnace Creek Resort. 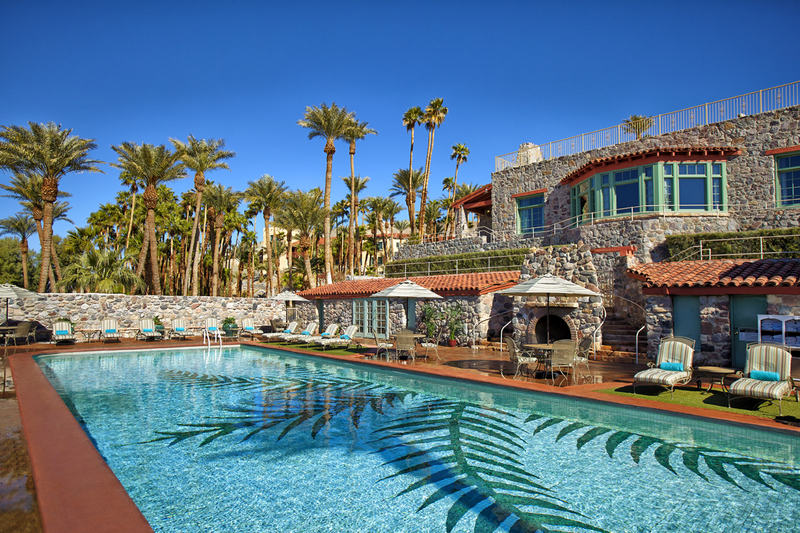 The property is actually one resort with two hotels: the historic, AAA Four-Diamond, 66 room Inn at Furnace Creek and the more family-oriented, 224 room Ranch at Furnace Creek. The two hotels offer different experiences. 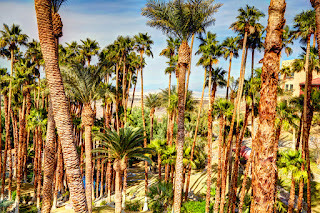 The Ranch at Furnace Creek, with its towering palm trees and oasis atmosphere, is situated on the desert floor. Fed by spring waters, The Ranch boasts a large pool where the water temperature is 84 degrees in winter, a golf course, post office, general store, casual dining restaurants, horseback riding and 224 family-friendly rooms. 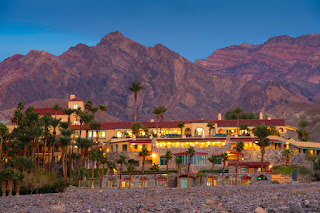 The Inn at Furnace Creek offers a more sophisticated, refined and romantic experience. 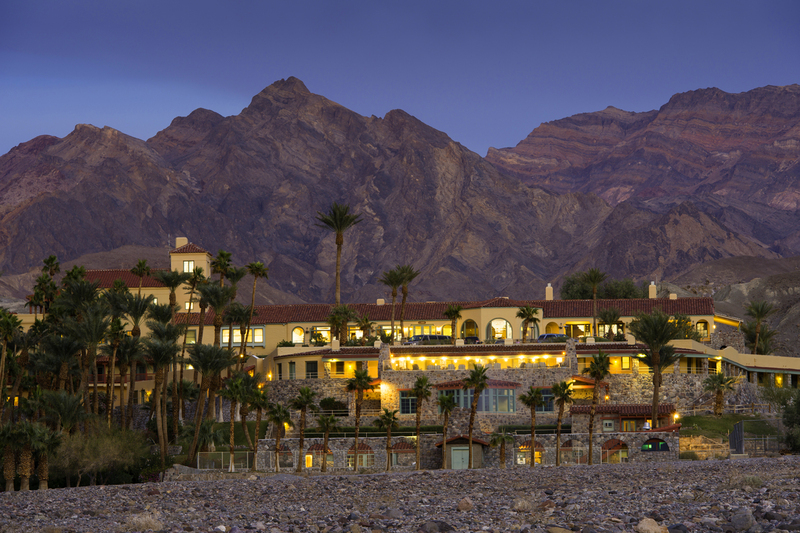 Nestled into the mountainside, the Inn was built in the late 1920s by the Borax Company. 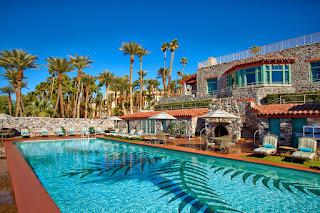 Today, it features 66 elegant rooms, fine dining, verandas with sweeping views of Death Valley, opulent gardens, a stunning spring-fed pool, tennis courts and pool-side massages. The resort also includes an RV park and Fidlers’ Campground for those intent on roughing it. Though the sites do not have water, sewer or electrical hook-ups, the very modest $18 per night fee includes access to the Ranch’s natural spring-fed swimming pool, shower facility, coin operated laundry and sports courts including a tennis court, shuffleboard, volleyball, boccé ball and basketball court. The Campground is located close to the restaurants including the Forty Niner Café, Corkscrew Saloon and The Wrangler Steakhouse, as well as the General Store for camping supplies, groceries and sundries. In addition to the activities within and around the resort, Death Valley served as one of the sets for the original Star Wars movie, so fans may want to visit movie locations including Dante's View, Mesquite Flat Sand Dunes, Desolation Canyon, Artist's Drive and Golden Canyon. Vacationers who want to observe a real galaxy far, far away could not pick a better location. Death Valley National Park is designated as the largest Dark Sky National Park in the country and as one of the only gold-tier International Dark Sky Parks in the United States. Furnace Creek Resort and the National Park Service have taken measures to greatly minimize light pollution, making it possible for stargazers to see the Milky Way Galaxy with the naked eye. Those seeking such a respite can take advantage of a 30-percent discount on select dates. These value-driven prices are available at The Inn from Nov. 27 through Nov. 30; on Dec 4, 6, and 9 through 18; and on Jan. 11, 12 and 29, 2017. Discounted rates are available at The Ranch from Nov. 27 through 30; Dec. 4 and 9; Jan. 4, 5, 18, 22, 23, 25 and 26, 2017; and Feb. 5 and 6, 2017. Rates are per room, per night and do not include taxes and resort fees. Reservations can be booked online and using promotional code PROSPECTOR, or by calling 800-236-7916. Guests over 50 can also save up to 30 percent at either hotel. For a one-night stay, guests will receive 10 percent off the rack rate. A two-night stay equals a 20 percent savings and three or more nights will result in a 30 percent discount. Those discounts are available by using the promo codes SENIOR, SENIOR20 or SENIOR30.